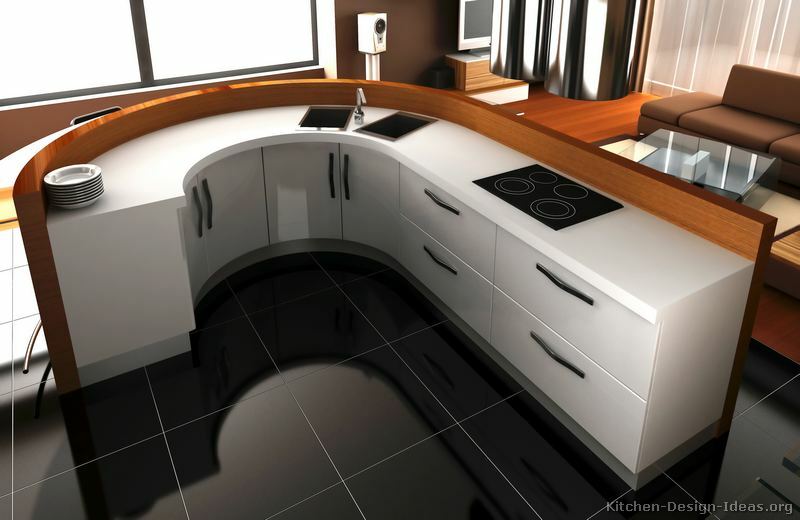 Shapely Design: This contemporary white kitchen features rounded cabinets that combine to form a semi-circle. 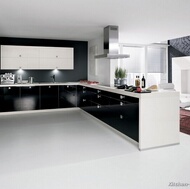 The main kitchen prep area is located in the curved island, while the refrigerator and ovens are on the back wall. Look closely and you'll see that this image is actually a conceptual 3D render. Fashioned for Work: You may have heard of an L-shaped kitchen, or even a U-shaped or G-shaped kitchen... but a J-shaped kitchen? The radius cabinets allow for quick access to various appliances without moving around much. While I'm not a big fan of split sinks (since you must turn off the water when going from one sink to the other), it does provide better isolation between washing dirty dishes and cleaning fresh fruits and vegetables. 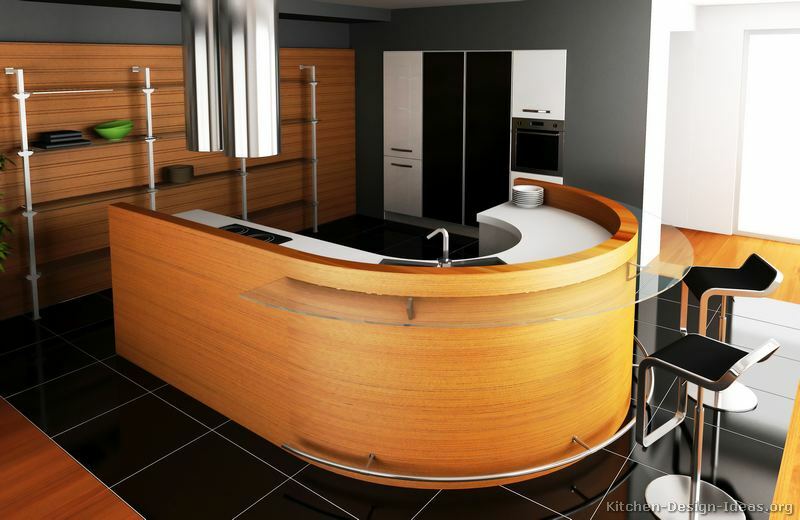 Modern Features: The backside of the island features horizontal-grain wood for a streamlined look. Along the curvature of the island, a glass countertop suspended by metal supports provides a sleek breakfast bar. Over the island, dual chimney hoods supply professional-level ventilation for the cooktop without becoming visually obtrusive. Along the back wall, which is lined with wood, a number of suspended glass shelves allows quick access to everyday dishes. The adjoining wall, painted gray, supports built-in appliances and a pull-out pantry. 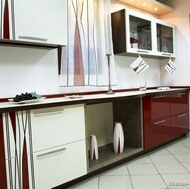 Similar Pictures: This kitchen is #244 (on page 9) in the Modern Two-Tone Kitchens gallery. 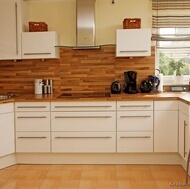 You may also want to see our feature article and accompanying photos on Contemporary Kitchen Cabinets.